We run a range of courses to ensure you have the key life skills to deal with the unexpected! And leave with the confidence & skills that could save someones life! Designed for managers who require a full understanding of health and safety and employees at all levels to provide an understanding of their responsibilities. 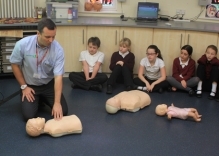 Exe Training Solutions with its team of professional Primary and Secondary teachers are bringing Basic Life Support into schools. Exe Training Solutions - offering you the bespoke training package your business needs. 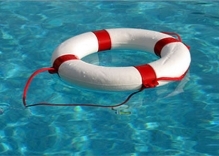 Based in the South West and with trainers in the North West and Midlands we deliver a full range of training services including National Pool Lifeguarding Qualifications (NPLQ), First Aid at Work, Paediatric and AED courses, Health & Safety, Fire Safety, Manual Handling, Risk Assessments and more…. Our courses are designed to ensure that you have an adequately trained workforce to meet the legal requirements of any legislation. 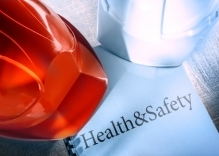 Whilst we have a strong emphasis on Health and Safety related courses we don’t stop there…. We train the trainer, offer UK Sport Multi Sport qualifications, ASA Swim teaching courses both Level 1 and Level 2 plus Primary and Secondary CPD’s in Physical Education & Sport Coaching. 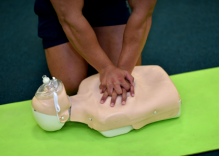 New for 2015 Exe Training Solutions with its team of professional GTC QTS teachers are bringing Basic Life Support into schools. With over 10 years’ experience in Secondary Physical Education Simon and the team are on a mission to take good quality teaching into schools and ensure that children from the age of 10 understand what to do in an emergency and how they can help in those vital minutes. Teaching techniques such as CPR, Secondary Surveys, Spinal awareness, Water Safety, who to contact and what to say! The perfect building block for a young person’s future in life skills. We run courses all over the UK from St Austell to Aberdeen, from Croyde Bay to Great Yarmouth…. We have even taken quality teaching to the UAE and delivered Water Safety programmes to both Hotels and Schools. Exe Training Solutions Ltd continue to use professionally qualified teachers who are also medically trained to ensure delivery of our courses are to a high standard and cater for all learners. Whether you are a visual learner or the practical hands on type, whether you learn by listening or placing your head in the easy to follow manual, believe us when we say you WILL learn and you WILL have fun whilst doing so! As secondary school teachers we are taught to differentiate, as Paramedics and First Person on the Scene persons we are trained to think fast and adapt to any situation. It is this that sets us apart from the rest. We look forward to working with you in the future and are always at the end of the phone if you need to talk or need any advice. We are a National Training Company delivering work based qualifications to the industry. 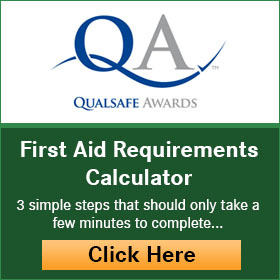 First Aid at Work, Health & Safety and Pool Lifeguard Courses delivered at your place or ours. © Copyright 2018 by ExeTraining. All Rights Reserved.